Kongpo Bonri, the Bon Mountain where Khandro Dechen Wangmo stayed in retreat and had many spiritual experiences. Consort and spiritual companion to the terton Sang Ngak Lingpa, it was Dechen Wangmo’s dreams that alerted him to the location of many terma as well as giving the key for opening them. Traveling to Hor, the couple stopped by a lake whereby Khandro Dechen Wangmo retrieves the terma of a statue of Ludrup Yeshe Nyingpo as well as a sacred text from the water spirits guarding the lake. Having arrived in Hor, she is asked by the king of Hor to give teachings in addition to the teachings and empowerments given by Terton Lingpa. She had her own disciples, some of whom compiled a hagiography of her which details her many pilgrimages, terma revelations and dreams and sacred visions. Her importance and realization was recognized by many lamas who wrote long life invocations for her. 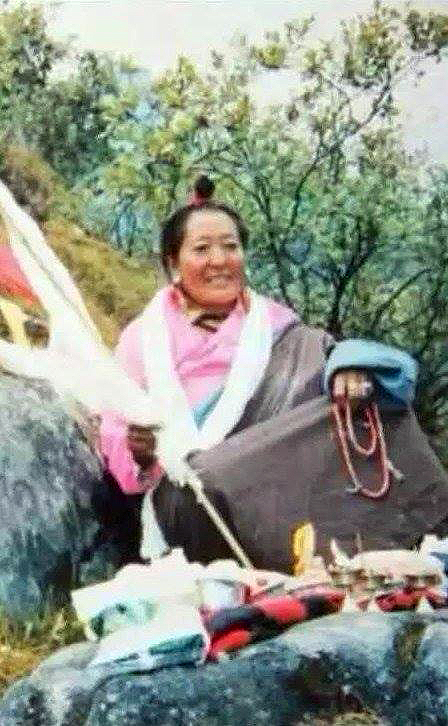 She and Terton Lingpa traveled extensively but their activities were mainly focused in the Amdo area of Tibet. Khandro Khachö Wangmo (1940-1987) was considered an incarnation of Khandro Dechen Wangmo. She was the daughter of Kundrol Drakpa who was also known as Kundrol Humchen Drodul Lingpa and was a lineage lama and terton of Sar Bön, or New Bön. She was a realized practitioner and tertön who in 1986 discovered a small statue of Amitayus, a nine-pointed dorje and blessed khandro dust from the sacred mountain Kongpo Bönri in south-eastern Tibet. Her discovery was witnessed by the public and documented in an essay by Span Hanna entitled Vast as the Sky, the Terma Tradition in Modern Tibet which is included in the book Tantra and Popular Religion in Tibet by Geoffrey Samuel and Hamish Gregor, edited by Elisabeth Stutchbury. Posted on July 31, 2016, in Pilgrimage, Tibetan Culture & History, Tibetan Lamas, Uncategorized. Bookmark the permalink. 1 Comment.